Binalot, a Filipino comfort food quick-serving restaurant which has been operating since 1996 sees 2018 as a year of growth as it eyes 20-25% growth. Binalot will be opening up 5 company-owned and 10 franchise stores in the country even as it looks for foreign partners to put up stores abroad. It already has two stores in Dubai and one in Abu Dhabi although it wants to expand in other areas of the Middle East where there are huge concentrations of Filipinos. 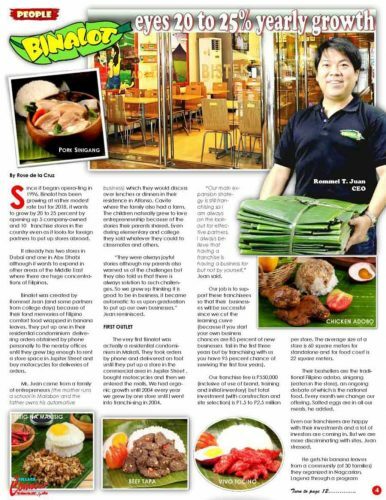 Binalot was created by Rommel Juan (and some partners from college days) because of their fond memories of Filipino comfort food wrapped in banana leaves. They put up one in their residential condominium delivering orders obtained by phone personally to the nearby offices until they grew big enough to rent a store space in Jupiter Street and buy motorcycles for deliveries of orders. Juan came from a family of entrepreneurs (the mother runs a school in Malabon and the father owns his automotive business) which they would discuss over lunches or dinners in their residence in Alfonso, Cavite where the family also had a farm. The children naturally grew to love entrepreneurship because of the stories their parents shared. Even during elementary and college, they sold whatever they could to classmates and others. “They were always joyful stories although my parents also warned us of the challenges but they also told us that there is always a solution to such challenges. So we grew up thinking it is good to be in business, it became automatic to us upon graduation to put up our own businesses,” Juan reminisced. The very first Binalot was actually a residential condominium in Makati. They took orders by phone and delivered on foot until they put up a store in the commercial area in Jupiter Street , bought motorcycles and then we entered the malls. We had organic growth until 2004 every year we grew by one store until I went into franchising I n 2004. “Our main expansion strategy is still franchising so I am always on the lookout for effective partners. I always believe that having a franchise is having a business for but not by yourself,” Juan said. Our job is to support these franchisees so that their businesses will be successful since we cut the learning curve (because if you start your own business chances are 85 percent of new businesses fail in the first three years but by franchising with us you have 95 percent chance of surviving the first four years). Our franchise fee is P550,000 (inclusive of use of brand, training and initial inventory) but total investment (with construction and site selection) is P1.5 to P2.5 million per store. The average size of a store is 60 square meters for standalone and for food court is 22 square meters. Their bestsellers are the traditional Filipino adobo, sinigang (eaten in the store), an ongoing debate of which is the national food. Every month we change our offering. Salted eggs are in all our meals, he added. Even our franchisees are happy with their investments and a lot of investors are coming in. But we are more discriminating with sites, Juan stressed. 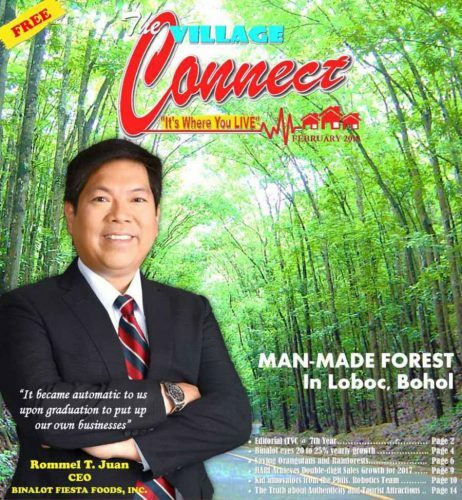 He gets his banana leaves from a community (of 30 families) they organized in Nagcarlan, Laguna through a program DAHON, his CSR, since Nagcarlan has 700 hectares of wild banana farms. He has been getting 80 percent of the leaves from this place. Wherever we go we try to find communities we can support. Per store, the average food line is 12 (as quick service restaurant you must stay lean in your offering) so with the combinations, it is a total of 40 lines. Most of our customers are dine- in (with 20 percent take out) and deliveries. We are beefing up our logistics to boost our deliveries, where we started. He would like to think that Binalot is still an SME (the advantage of being small is you are nimble and can react fast). He already has a commissary in Paranaque which has a walk-in freezer and walk-in chiller now. The commissary supplies the provincial branches by boat for mixes but meats and veggies are sourced locally. 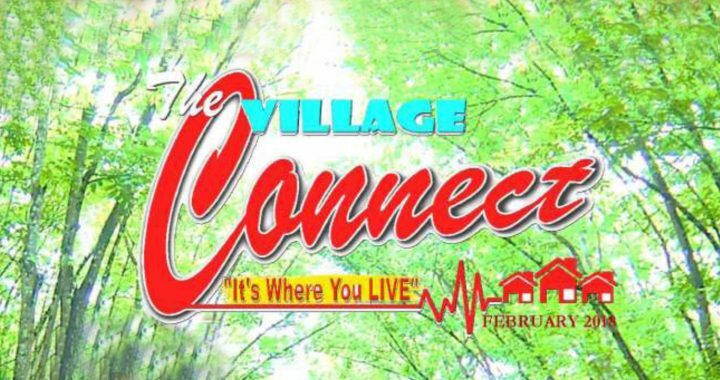 In the Visayas Binalot has branches in Iloilo, Bacolod, in Mindanao we are in Davao and looking at Dumaguete. Juan said Luzon still has a lot of potential with so many malls and food parks rising. Stores in Metro Manila comprise 90 percent. In next three years, we are focused on domestic growth although we want to go to foreign countries with a lot of Filipinos like Singapore and other Middle Eastern countries (Qatar, Saudi Arabia). Our belief is we service the franchisee (our customer) and their end customer is theirs. A lot of their franchisees are professionals, ex-IT professionals, and fresh graduates. This year we are looking at five company-owned and 10 franchised stores. Our target is to grow 20 to 25 percent a year.